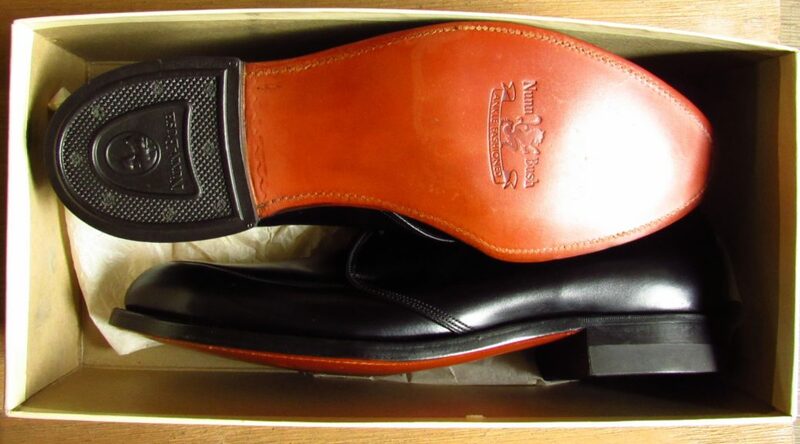 I look at eBay often for vintage shoes. Probably too much. I mainly look for shoes in my size but I sometimes look for shoes for various readers of this blog. By request. This searching takes time since there are about 4 million men’s shoes currently on eBay. Of that total, there are about 500,000 men’s dress shoes. And sellers often mislabel their listings. To speed my search, I have written some software to help me find the gems. The shoes I search for are good deals (no or low wear with a low price), or are significant in some way (rare or remarkable shoes). When I find a good listing, I add it to my watch list to track its progress. My watch list has become sort of a curated eBay vintage shoe list. I am not planning on buying these shoes. Well maybe a few. I already have enough shoes but I keep searching for the next perfect pair. Of course. The list is mainly focused on vintage shoes from the USA and Canada. I also have been watching a number of quality vintage shoe trees. There are some excellent shoe trees on eBay at low prices. I plan on writing a shoe tree article at some point. I added controls to help filter the listings by brand and size. You can also sort by listing time. Take a look and let me know what you think. JSYK, I am not selling these shoes and sellers aren’t paying me to feature their listing. So I can’t vouch for the quality of the item or the integrity of the seller. Buyer beware. Thank you! Nothing showing yet in my size (11.5 A) but I’m excited to see what pops up. An excellent addition to the site! Great work. I found your site while researching bookbinder leather. (Yes, I got snookered!) I had never considered buying vintage shoes but your blog changed my mind. Plus, I’m amazed at how nicely you’re able to recondition them. Similar to a bookmark, adding an item to your Watch List lets you easily come back to it to take another look. If you decide to bid or buy the item, you can do it quickly by clicking the watched listing in My eBay.